Two weeks ago, and after some conversation, am idea ran through my mind. How about we do some shots of Harley’s? Better yet why don’t we HDR this American Classic, and even better still, how about we contact our local Harley dealerships and lets present this idea to them. Well Bingo, after some social media magic, Jim and I were contacted by old friends, and we brought this project to life. My first shot. The American Classic in HDR black and white. I shot 9 photos to compose this image and you can see that on the light side of the stack we captured the highlights that were offered by the setting sun, as well as the soft reflections and contrasting points of focus offered by the angle of light reflection. 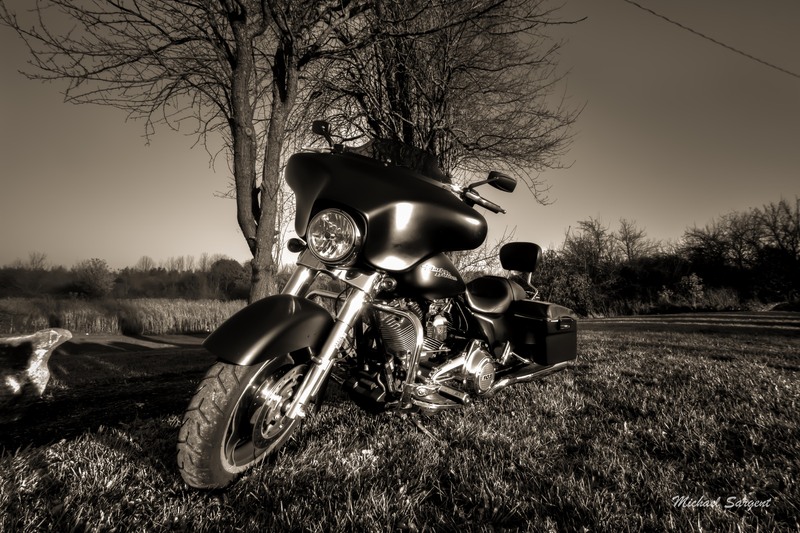 On the darker side of exposure stacks, the deep rich shadows offer a contrast in black that made the bike pop out of the photo. Despite the apparent sky shadow that is include with many HDR shots, and after careful examination of the photo itself I choose to leave it as it was because I simply loved the classic feel of the overall composition. Shot with a 7d and the Tamron 10-22mm ultra wide-angle lens. F-8 at iso 400 and the shutter started at 1/500th of a second. My next shot was done in color and having taken the majority of shots during the golden hour of light, I can only say one thing about this time of day. INCREDIBLE. Knowing that this is the best time for taking pictures, I took full advantage of every second and was able to create this HDR color photo. My only complaint with this shot is the highlight located on the fairing of the bike. Although it is interesting and a part of HDR shooting, many years of photography have taught me that once a spot is overexposed or washed out, you can’t simply use a slider in lightroom to reduce a highlight. It however adds something to the picture, but right now I cant figure out just what that is. Anyway the great part of doing these pics, was the connection that was made by using that social media magic. In the future Jim and I will be doing some shots for one of our local Harley Dealerships that saw these and said WOW! Thus once again THE POWER OF SOCIAL MEDIA!!!!! With several shots still to be edited, I wanted to give a quick preview of our current project, and get your thoughts on these images. I also would like to thank my partner, Mr. Jim for meeting me on location and doing what he does best. Jim has also captured some amazing images, and you can see those on the MSP Facebook page. I also want to give a huge shout out, and my thanks to a dear old friend, Charlene. Charlene thank you for making this happen. I enjoyed this shoot and I am excited to see how the other shots still to be edited turn out. One last thank you to Charlene’s fiance Brian. Brian, your bike is a piece of artwork. 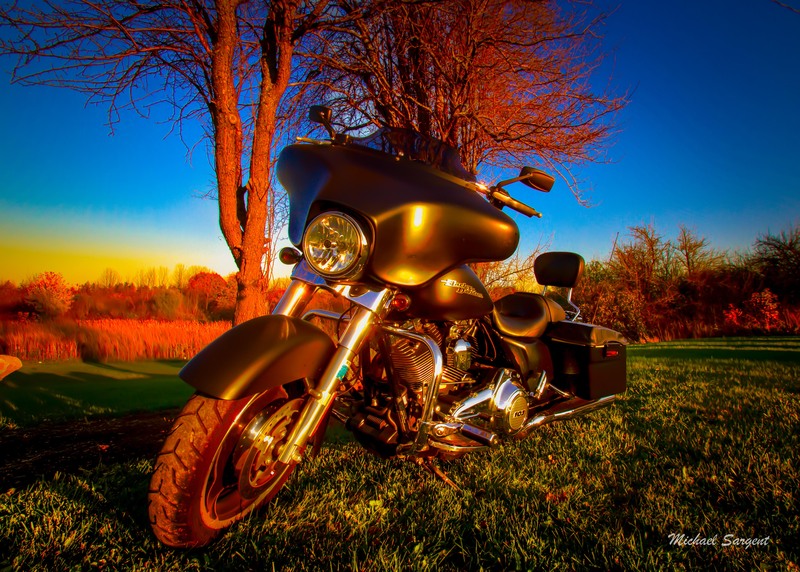 I am so appreciative that you allowed me to take this shots, and took some time to share with me your experiences as a Harley owner. My respect,admiration and appreciation are with you. This entry was posted in M. Sargent Photography, Michael Sargent, Photography, Projects, www.mrsargent.com and tagged creativity, Harley Davidson, HDR Photography, M.Sargent Photography, Photography through the eyes of the hunter, www.mrsargent.com by msargentphotography. Bookmark the permalink.